A piano and a Live Christmas tree! My goal is to post 12 pictures (aka "The twelve days of Christmas" which Stephen says derives from the time between Christmas and Epiphany which is the that the wise men are said to have shown up) over the next couple of weeks. 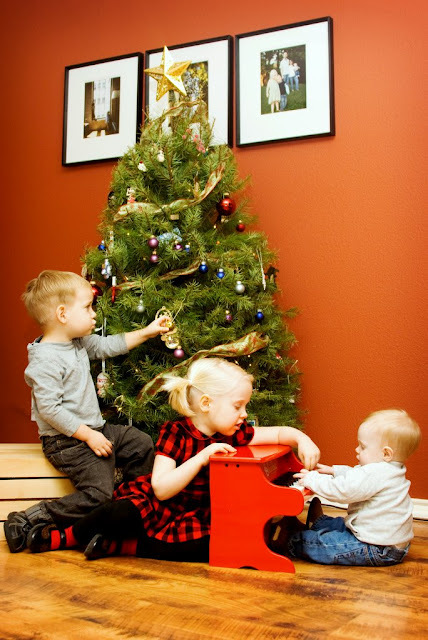 Before we actually leave for our journey to Indiana, I wanted to share a picture of my kids in front of our cute little LIVE Christmas tree. Schroeder is playing his new piano which was D'arcy's gift to him. She had him in our family drawing. This piano is the first of many I just have a feeling!!! wow, that is a BEAUTIFUL photograph.